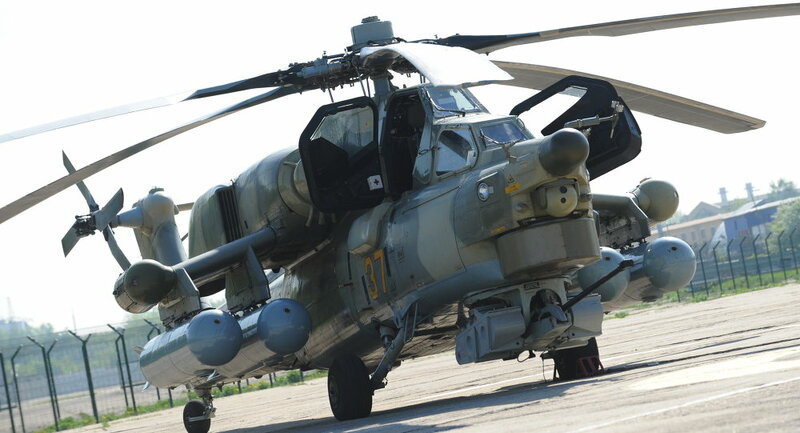 The latest, upgraded, version of Russia’s Mi-28N “Night Hunter” helicopter gunship will be virtually invulnerable to enemy fire, Zvezda TV reported. Even though it looks much like its predecessor, the Mi-28NM boasts the latest and most innovative materials available and is armed with the most advanced active defense systems money can buy. The “Night Hunter” is also equipped with circular-view radar previously installed on export models only. However, according to the makers of the “Night Hunter”, the NO25E radar offers a notable improvement over even the export-oriented unit. Another thing making the souped-up Mi-28NM so special is its unique laser system designed to deflect all existing heat-seeking missiles. The moment the system “learns” about the helicopter being illuminated by enemy radar, it creates an invisible “fire cloud” near the rotorcraft effectively deflecting incoming missiles which, failing to engage their imaginary target, self-destruct. Improved rotor blades will add 10 percent to the helicopters’ maximum speed of 340 kilometers per hour. 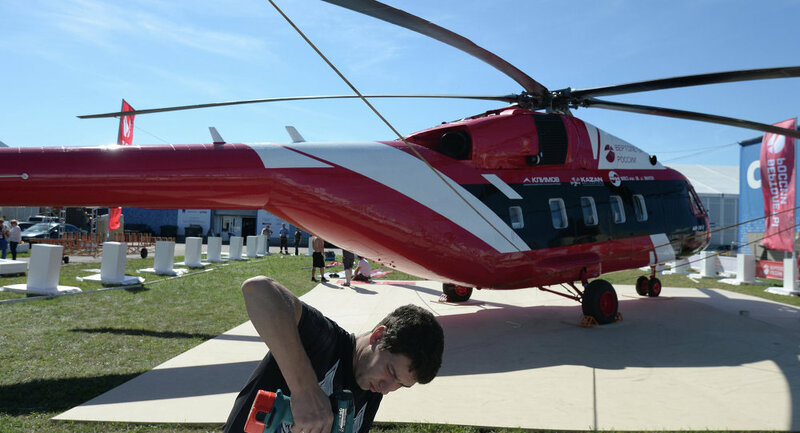 Russian-made Mi-38 multirole civil helicopters attracted the attention of foreign buyers at Farnborough Airshow in the United Kingdom, the manufacturer said Tuesday. MOSCOW (Sputnik) — Farnborough International Airshow will run in Hampshire, England from Monday through Sunday. It is expected to draw thousands of trade visitors. In 2014, it brought $204 billion worth of confirmed orders. “The Mi-38 multirole helicopter showcased by the [Russian Helicopters] holding at Farnborough Airshow attracted considerable interest of foreign contractors from several countries,” the company’s statement read. The Russian helicopter-maker plans to build the passenger and “offshore” versions of the Mi-38 helicopter to widen the range of missions it can be deployed in. The chopper can be used for search-and-rescue operations and serve as a flying hospital. Russia’s record-setting Mil Mi-38 medium multirole helicopter which reached an altitude 8,600 meters has appeared on the defense procurement program. In an interview with Zvezda TV the program’s director Alexander Akhromeyev revealed the new helicopter’s combat modifications and the potential it holds in domestic and global markets. When asked whether the Mi-38 was a completely new design or just an upgraded version of an existing rotorcraft, Akhromeyev said that it was an essentially new helicopter with many of its elements developed from scratch, including the engine, fuselage and a new rotor made from composite materials.Speaking about the niche the new helicopter could fill and its potential buyers, the director said that Mi-38 will be used in a wide variety of spheres; from transporting passengers and cargo flights (over 5 tons) to search and rescue missions. He also noted that the Mi-38 was designed as a transport helicopter, not a combat one. “It could be used to haul in cargoes and reinforcements during combat situations, engage in search-and-rescue operations and serve as a flying hospital. If need be, it could carry arms too,” Akhromeyev explained. The new helicopter can also be used in the mountains. “Two years ago the Mi-38 set a world record reaching an altitude of 8,600 meters, which is almost as high as Mt. Everest [8,848 meters],” the director said. Once the new helicopter has received an international certificate, Russia could start selling it abroad, above all in the countries which have traditionally relied on Russian-made aircraft. When asked whether the Mi-38 was being built entirely from Russian-made elements, including the engine, Akhromeyev said that the TV-7-117V engines were 100-percent Russian, just like the system of pumps and onboard electronics. “Even though some of the electronic elements used on the Mi-38 are foreign-made, we are working hard to replace them with our own, especially the ones we can no longer buy abroad due to the sanctions,” Alexander Akhromeyev said. Serial production of the Mi-38 helicopter has already begun in Kazan and the new helicopter is currently undergoing a second stage of certification so that it meets the most stringent demands of potential buyers in Russia and elsewhere in the world.